This recipe had been sitting on my counter all summer long. 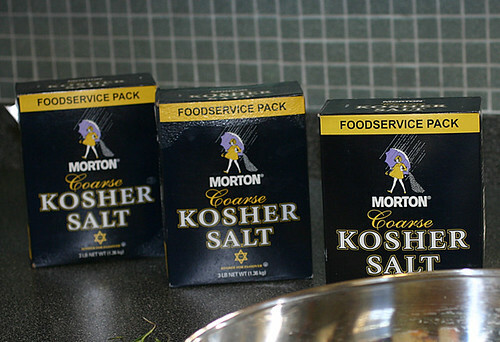 Not the recipe, but rather the three, three pound boxes of salt. Taking up precious counter space and staring me down at every turn. Why I let this linger so long I can’t say, and the sad thing is, is that there really wasn’t anything special about this other than it was extremely time consuming. I could have made this chicken in half the time with less than half the effort. I guess what I’m saying is that this one could go into the clunker and stinker pile. Except, it’s so gosh darned impressive looking to guests! And the recipe came from my new fave Francis AND Steven liked it so much he put it in his new cookbook. If you have the time you can prep this early and just throw it on the grill and forget about it. Have a drink and converse with your friends. Isn’t that what entertaining is all about? This chicken is super moist, but not very crispy. The fresh garden salsa takes care of its peakish yellow looks and a good French bread served along side would be perfect. Another plus is you can learn how to truss a chicken (video). 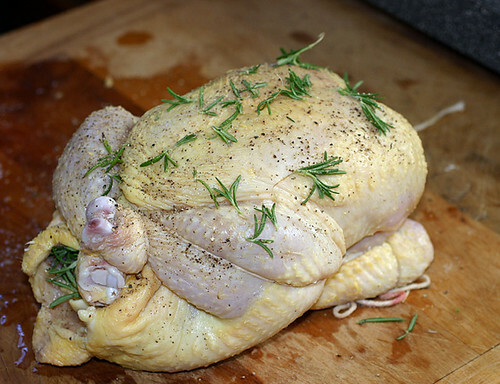 But before you truss, rub the bird with some olive oil, sprikle with some fresh ground pepper and throw some fresh herbs on top. 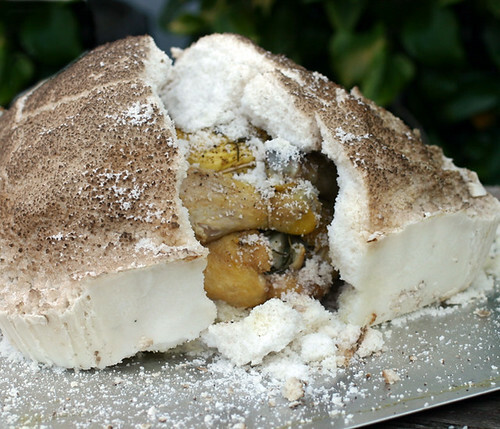 You can also put some lemon wedges in the cavity. 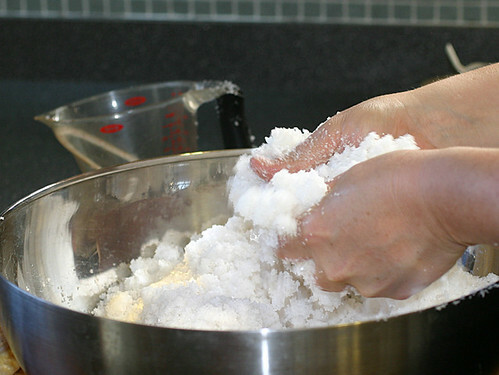 Pour all 9 lbs of salt in a big bowl with 1 Cup of Water. 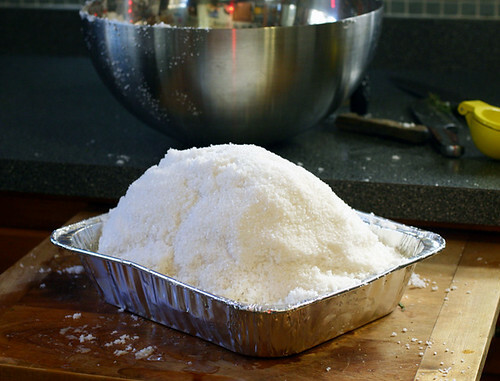 Layer some salt in the bottom of a 9’x13″ pan, then set your chicken on top. 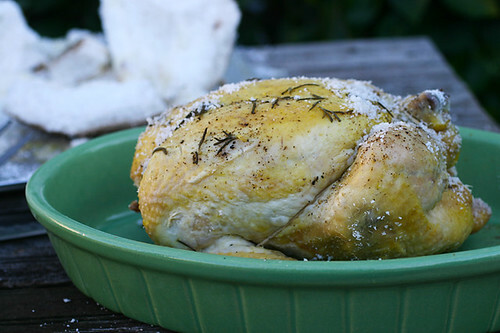 Cover the chicken completely with the rest of the salt. Really pack it on tightly. 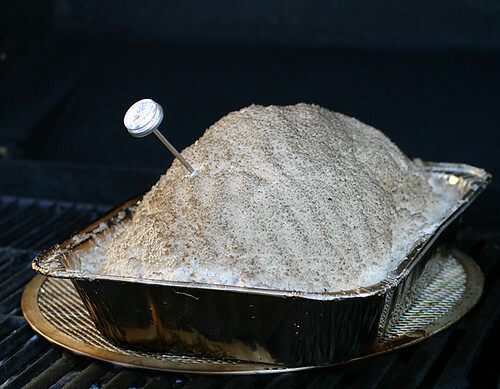 Grill for 1-11/2 hours until bird reaches 165 on a thermometer. You’re also supposed to use wood chips, but I couldn’t taste any smokiness at all whatsoever. 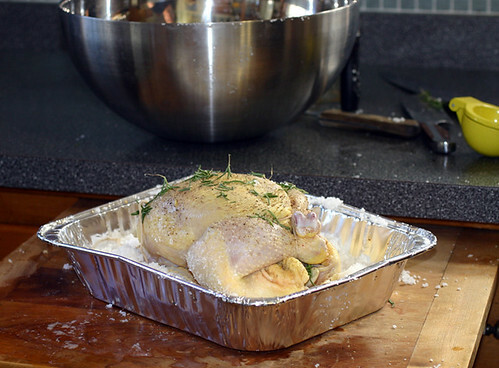 Remove chicken from pan to a sheet pan or cutting board. Crack that sucker with a heavy blunt object. A hammer would work well. Tear away the salt crust. Mix together and serve over chicken. Neat! I think my son would have a blast making this with me. Well, the blast would come when we broke it apart! 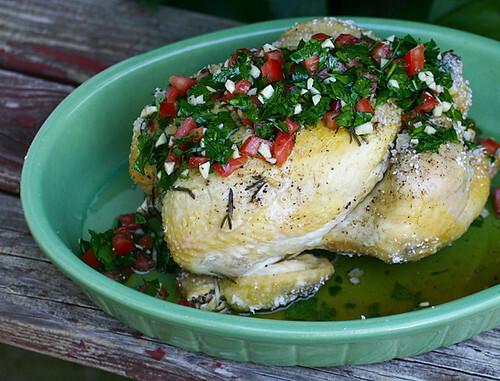 Okay, the end result looks amazing, but I have to think that I would miss the cripsy skin of grilled chicken! 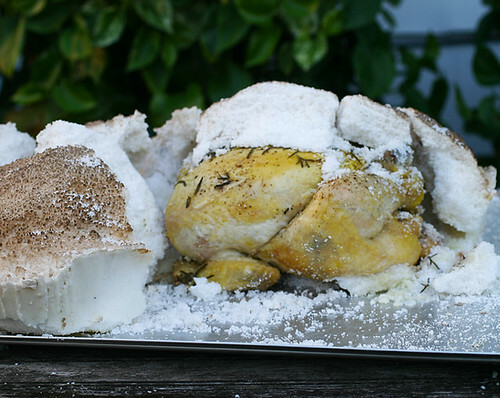 Looks like the chicken covered in snow! Great entertaining decor for the winter here in Florida however I have to agree it might not be worth all of that work. 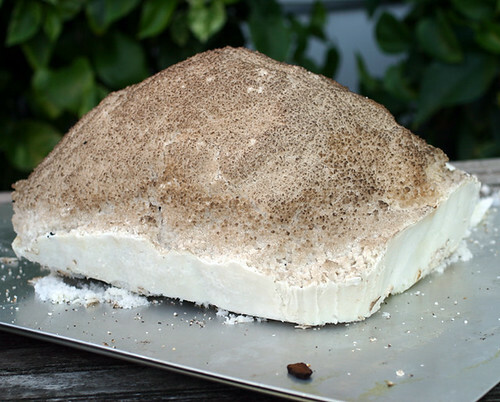 Very interesting recipe and beautiful photos as always Mary. Yumm! This looks delicious, and really fun to make! It’s always disappointing when you put a lot of effort into a recipe, but it doesn’t turn out how you envisioned. But the salt crust looks pretty darn cool! This is one of my favorite recipes. I love how moist it is!! Woah, this looks really impressive!! Plus the chicken looks really delicious! Looks cool! Although I hate it when the hype for a dish (or a movie) is better than the actual thing. Oh well!! Holy mother of Salt! Chicken looks great!